#elxn42’s campaign promises on income inequality have, so far, largely focused on the middle class. While this may be politically expedient (for instance, 88% of respondents polled by Pollara consider themselves to be either middle class or working class), let’s not forget about the importance of alleviating poverty across the country — and the glaring need for federal leadership on this file. Ontario began unfolding its plan to reduce poverty in 2008. And today marks the first anniversary of the province’s announcement that it is committed to a second poverty reduction strategy, including the bold and welcome commitment to end homelessness in Ontario. Early data showed that the first strategy made a difference, reducing child poverty by 9% in the first three years. The province made some big investments during the initial years of that first strategy: increasing the Ontario Child Benefit, introducing full-day kindergarten for four- and five-year-olds, and increased funding for child care. The strategy included labour market policies like minimum wage increases and investing in the youth jobs strategy. The recession hit the same year that the first strategy was introduced — and with it came an increase in unemployment and an acceleration of precarious and unstable work across the province. Those early investments in poverty reduction made a difference during the worst of the recession. Ontario was arguably hit hardest by these trends and the shift from manufacturing to other industries. While the strategy made early dents in the poverty rate (it dropped to 15.1% in 2011) by 2013 it was back up to 15.6% — almost as high as it was in 2008 and higher than it was before the recession. Further progress on poverty reduction stalled as the province entered in budget austerity mode, putting the brakes on some aspects of its strategy. That shift away from manufacturing employment has had a huge effect on local labour markets across the province — chipping away at solid, middle-class jobs and leaving a lot more Ontarians in precarious situations. 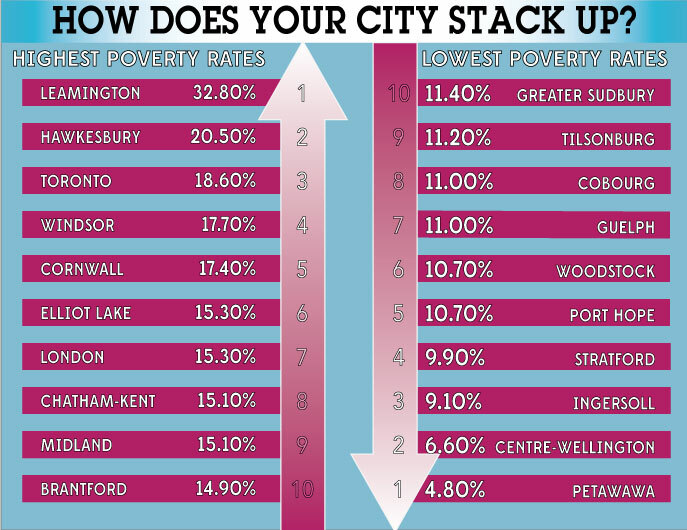 My home town of Leamington is one of those Ontario communities hurting from the loss of a large, international employer and it’s being reflected in the province’s poverty numbers: Leamington has the highest poverty rate in the province at 32.8%. Hawkesbury comes in second worst at 20.5%. Toronto comes in next with a poverty rate of 18.6% — that’s higher than pre-recession levels. Another important fact: in 2013 more than 20% of all people living on low-income lived in Toronto. Nationally, the poverty rate sits at 14.6% — down slightly from its pre-recession rate of 14.9%. Across the country, 10 out of 13 provinces and territories have implemented poverty reduction strategies over the last number of years. While they should be doing more, they are, in fairness, missing a committed federal partner. A comprehensive federal poverty reduction plan was developed in 2010 by the Standing Committee on Human Resources, Skills and Social Development and the Status of Persons with Disabilities but no concrete action has been taken to implement that plan. Instead we’ve seen the government double down on skills development and labour market connections, with very little recognition that the nature of work is changing or that our social safety net has eroded. This lack of federal leadership on poverty reduction has not gone unnoticed by the international community: Canada has been called out on its human rights record a couple of times in the past few years, including in 2013, when the UN special envoy on the right to food found that Canada is failing indigenous people and the poor. But, still, no federal action. Most provinces and territories have been taking steps to do their part. It’s time the federal government did the same. Poverty reduction deserves full consideration during this year’s federal election campaign. For more information about what the federal government could do, visit goodforcanada.ca – CCPA’s platform to end income inequality across the country.